A Bankart procedure, also known as a Broca-Perthes-Bankart procedure, is a surgical technique for the repair of recurrent shoulder joint dislocations. In the procedure, the torn ligaments are re-attached to the proper place in the shoulder joint, with the goal of restoring normal function. The shoulder is the junction of three bones: the upper arm bone (humerus), the collarbone (clavicle), and the shoulder blade (scapula). The shoulder joint (glenohumeral joint) is the result of the head of the humerus bone fitting in the cavity of the shoulder blade (glenoid cavity), the joint being held together by the labrum, a rim of soft tissue that surrounds the glenoid. As a result of excessive force being applied to the arm, the head of the humerus may be forced out of the glenoid cavity (dislocation), and the supporting ligaments of the shoulder joint may be torn. These ligaments may heal so that the shoulder regains its stability. However, sometimes the ligaments do not heal, making the shoulder unstable and painful. This condition is referred to as traumatic instability of the shoulder, traumatic glenohumeral instability, or a Bankart lesion. The goal of a Bankart procedure for traumatic glenohumeral instability is the safe and secure re-attachment of the torn ligaments to the tip of the glenoid from which they were detached. The surgery has the advantage of allowing patients to resume many of their activities of daily living while the repair is healing. The surgery also minimizes the unwanted joint stiffness associated with such injuries. The shoulder is the most commonly dislocated major joint following severe trauma, such as an auto collision or a fall onto an outstretched arm. Some 96% of dislocations involve the front of the shoulder (anterior), with 1–3% occurring in the back (posterior). Falls and car accidents are common causes of first-time dislocations, but recurrent dislocations are often due to seemingly inoffensive activities such as raising the arm over the head, or combing hair. Shoulder dislocations are more common in males than females, and in young adults. 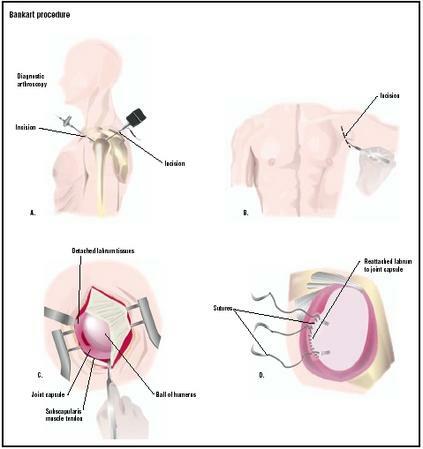 In general, shoulder surgery can be performed in two fundamentally different ways: either using closed surgical techniques ( arthroscopic surgery ) or using open surgical techniques. An open surgery Bankart procedure is performed under general anesthesia. The patient is placed in a 30-degree inclined chair position with the arm free over the edge of the operating table. A bag is placed under the center of the shoulder blade of the shoulder being operated on to support the shoulder and to push the shoulder blade forward. Prepping and draping allow the arm to be freely moveable and allow a good view of the surgical field. The whole upper limb is prepared with antiseptic. An examination under anesthesia is performed to confirm the exact nature of the instability. The surgeon makes a long incision to gain access to the joint, often cutting through the deltoid muscle to operate on the internal structures of the shoulder, and proceeds to sew the joint capsule to the detached labrum tissues. The arthroscopic Bankart procedure tries to imitate the open Bankart procedure. Arthroscopy is a microsurgical technique by which the surgeon can use an endoscope to look through a small hole into the shoulder joint. The endoscope is an instrument the size of a pen, consisting of a tube fitted with a light and a miniature video camera, which transmits an image of the joint interior to a television monitor. The detached part of the labrum and the associated ligaments are reattached to bone along the rim of the glenohumeral cavity through a small "keyhole" incision. This is done with little disruption to the other shoulder structures and without the need to detach and reattach the overlying shoulder muscle (subscapularis). The physician diagnoses a Bankart lesion from the patient's history, by performing a thorough physical examination of the joint, and taking the proper x rays. The examination often reveals that the head of the humerus slips easily out of the joint socket, even when it is pressed into it. This is called the "load and shift test." X rays may also reveal that the bony lip of the glenoid socket is rounded or deficient, or that the head of the humerus is not centered in the glenoid cavity. A diagnostic arthroscopy is also often used to confirm the presence and extent of the shoulder instability. In this procedure, a thin fiberoptic scope is inserted into the shoulder joint space to allow direct visualization of its internal structures. An electromyogram may also be obtained if the treating physician suspects the possibility of nerve injury. Patients should attend to any health problem so as to be in the best possible condition for this procedure. Smoking should be stopped a month before surgery and not resumed for at least three months afterwards. Any heart, lung, kidney, bladder, tooth, or gum problems should be managed before surgery. The orthopedic surgeon needs to be informed of all health issues, including allergies and the non-prescription and prescription medications being used by the patient. Exercises are usually started on the day following surgery with instructions from a physical therapist, five times daily, including assisted flexion and external rotation of the arm. The other arm is used to support the arm that underwent surgery until it can perform the exercises alone. The patient is allowed to perform many activities of daily living as tolerated, but without lifting anything heavier than a glass or plate. If a patient can not comply with restricted use of the shoulder, the arm is kept in a sling for three weeks. Otherwise, a sling is used only for comfort between exercise sessions and to protect the arm when the patient is out in public and at night while sleeping. Driving is allowed as early as two weeks after surgery, if the shoulder can be used comfortably, especially if the patient's car has automatic transmission. At eight to 10 weeks, the patient can usually resume light, low-risk activities, such as swimming and jogging. If involved in sports, the patient may return to training at three months. Hospital physiotherapy is rarely prescribed and only in cases of delayed rehabilitation or shoulder stiffness. Perioperative: Nerve damage during surgery and poor placement of anchor sutures. Within six weeks after surgery: Wound infection and rupture of the repair. Between six weeks and six months: Shoulder stiffness, recurrence of instability, failure of the repair resulting in shoulder weakness, failure of the anchor sutures. According to the American Academy of Family Physicians, the classic treatment of recurrent shoulder dislocations remains open surgical Bankart repair. This approach has a success rate as high as 95% in effectively removing shoulder instabilities. In a recent study of young athletes, Bankart repair was compared with three weeks of immobilization for the treatment of an initial anterior shoulder dislocation. The group treated surgically had fewer episodes of recurrent instability than the group managed with immobilization. Surgery for anterior dislocation of the shoulder fails in one out of 10 to one out of 20 cases, with a higher incidence of failure in arthroscopic Bankart procedures when compared to the open surgical approach. There is also a higher incidence of failure in patients who smoke, those who start using their shoulder vigorously very early after the repair, and in those with very loose ligaments. The Bristow procedure is an alternative surgical procedure used to treat shoulder instability. In this technique, the coracoid process (a long, curved projection from the scapula) with its muscle attachments is transferred to the neck of the scapula and creates a muscle sling at the front of the glenohumeral joint. Shoulders can be stabilized and strengthened with special exercises. During the early phases of such physical therapy programs, the patient is taught to use the shoulder only in the most stable positions—those in which the humerus is elevated in the plane of the scapula. As coordination and confidence improve, progressively less stable positions are attempted. See also Shoulder joint replacement ; Shoulder resection arthroplasty . Neumann, L., and W. A. Wallace. "Open Repair of Instability." In Shoulder Surgery. Ed. S. Copeland. London: WB Saunders, 1997. Parker, J. N., ed. The Official Patient's Sourcebook on Shoulder Dislocation. San Diego: ICON Health Publications, 2002. Warren, R. F., E. V. Craig, and D. W. Altcheck, eds. The Unstable Shoulder. Philadelphia: Lippincott Williams & Wilkins Publishers, 1999. Itoi, E., S. B. Lee, K. K. Amrami, D. E. Wenger, and K. N. An. "Quantitative assessment of classic anteroinferior bony Bankart lesions by radiography and computed tomography." American Journal of Sports Medicine 31 (January-February 2003): 112–118. Kim, S. H., K. I. Ha, and S. H. Kim. "Bankart repair in traumatic anterior shoulder instability: open versus arthroscopic technique." Arthroscopy 18 (September 2002): 755–763. Magnusson, L., J. Kartus, L. Ejerhed, I. Hultenheim, N. Sernert, and J. Karlsson. "Revisiting the open Bankart experience: a four- to nine-year follow-up." American Journal of Sports Medicine 30 (November-December 2002): 778–782. Massoud, S. N., O. Levy, and S. A. Copeland. " The vertical-apical suture Bankart lesion repair for anteroinferior glenohumeral instability." Journal of Shoulder and Elbow Surgery 11 (September-October 2002): 481–485. Porcellini, G., F. Campi, and P. Paladini. "Arthroscopic approach to acute bony Bankart lesion." Arthroscopy 18 (September 2002): 764–769. American Academy of Orthopedic Surgeons. 6300 North River Road, Rosemont, Illinois, 60018-4262. (847) 823-7186; (800) 346-AAOS. http://www.aaos.org . McNeal, Melanie, and David Lintner, M.D. "Traumatic Instability: ACLR or Bankart Procedure." Dr. Lintner. Copyright 2003 [cited June 7, 2003]. http://www.drlintner.com/aclr.htm . A Bankart procedure is performed in a hospital setting by an orthopedic surgeon specializing in shoulder instability problems. What are the different types of surgery available for shoulder instability? Specifically, how will my shoulder be improved by a Bankart procedure? Will surgery cure my shoulder condition so that I may resume my activities? How many Bankart procedures do you perform each year? thanks for this.. i had the surgery, and i didn't really know what they did to me, until now... this page really helped me further understand what happend in surgury, and wut was wrong w/ my shoulder!! I WENT FOR A BANKART OPERATION 4 WEEKS AGO. MY ARM CAN NOW MOVE FORWARD JUST PAST HORIZONTAL, AND SIDEWAYS HORIZONTAL. I STILL HAVE A BIT OF PAIN AND WHEN I KEEP MY ARM STILL FOR A WHILE AND THEN MOVE IT FEELS LIKE U BEND OUR FINGERS AND IT MAKES THAT NOISE IS THAT NORMAL. I have a type 4 AC dislocation, and also suffer from Parkinson's - albeit early stages under controlled drug treatment. It is now 11 weeks since I fell causing this dislocation, and although the shoulder does not give me so much pain now, I am suffering from what i think are muscle spasms, sometimes severe in the base of the neck, and I find it arduous and sometimes impossiblee to lift my head into a good posture. In fact my chin is often on my chest, making it difficult to eat and drink. Also wet shaving under the neck is only achieved when laying down as i cannot stretch my neck taut to shave properly. They have now agreed to surgery, but my question is will the muscles problem be solved as well, as sometimes it is pretty unbearable, and I cannot go out. Have others had this type of 'complication', and if so what were the results please? Thank you for providing the general information. I had the Bristow procedure, which worked and held up for years. Then I did something stupid and tore my shoulder up again. This time they did an endoscopic Bankart. I did exactly as the PT told me and my shoulder healed quickly. Within two months I was doing light weight lifting. It's been over two years and my shoulder is very strong, albeit with limited range of motion (I'll never be able to throw accurately). My Dr, my PT and the Bankart Procedure rock! Shoulder was torn out of its socket, 13 yrs later I finally can afford to get bankart procedure done. MRI showed torn ligament. Its been more than week and a half after surgery and have been doing prescribe exercises, but my arm still slips out. I can feel shoulder slip out and then a sudden stop, that sends intense pain up and down my arm. Is this normal? Did doctor leave the anchors loose? Need help please. Just had a bankart 2 weeks ago. All seems to be well except that it hurts! Have already seen the physio so hopefully will have a swift recovery. I had an open bankart repair almost 4 weeks ago. It took me about 3 weeks to feel myself again. The first week after the surgery was the worst for me. Im feeling alot better now. I go to physio every week once a week and still have to keep my arm in a sling. They say about 6 weeks all together for the sling. Recovering is going well, although I still cannot move my shoulder and if I do it hurts alot. I do the exercises at home with help because I cannot move my shoulder. I am hoping things turn out well. The only thing that is getting me now is the frustration of not being able to use my arm. I go in today for the Bankrt procedure, I am very nervous about it being that it is my birthday. I( am not looking forward to thewhole arm in a sling thing becaue I play eight differnt instruments and I will only be able to play onethe whole time I am in the sling. I am also not looking forward to the pain. I had an open Bankart about 10 years ago at MedClinic Sacramento (CA). Recovery was exceptional with 80-90 range-of-motion recovered within 1 week. I was able to return to work the next day, and to most activities within 30 days. Pain was manageable with NSAIDS and was virtually nil within 5 days. No-load circulatory stimulation is key to rapid recovery. Dislocated 3 times, and after the third, I had arthroscopic Bankart Procedure (1wk after trauma). Arm was immobilised for 3 weeks afterwards. Recovery since has been spectacular. Now 10 weeks after operation I can do 10 full press-ups with no shoulder pain. I'm still a little stiff at extremes of motion (arm vertical), but I have 98% mobility back and my shoulder feels stable like it did years ago. Couldn't be happier. for me, the hot tub and a game ready ice unit has been my savior...along with pain killers. I had the bankart op way back in 1972.I was told by a nurse that I was only the 2nd man in the UK to have this procedure. [A policeman from Leeds being the first]How true this is I don't know. All I can say the op was a complete success. My shoulder used to dislocate very easily. The surgeon warned me that I could get arthritis in the joint in later life.I'm 57 yrs now and no arthritis. My op scar is very wide and quite ugly but I have seen guys who have had the same op and the scarring is far neater these days. I've never had any trouble with my shoulder since. i know a person whoz had bankarts operation 4months back. patient is able to do many activities but the scapulohumeral rhythm is lost & after several physiotherapy sessions(mobilization & stretching & strengthing)still is unable to make clear movements. main problem is hyper use of trapezius muscle whenever taking arm in flexion or abduction & unusual lump at bicipal groove tht is very painful. can u suggest possible cause for it & way to get rid of it. Initially I dislocated my right shoulder 11 years ago and since that time I have dislocated nearly 50 times. It was well worth it for me to consider surgery as I'm sure you can imagine. Howdy fellow shoulder sufferers. I dislocated my shoulder in an injury in 1989. A few yrs ago I finally had insurance and was able to get the bankart repair after 17yrs of walking around w/it damaged. It dislocated fairly frequently. Probably 20-30 times over that 17yrs. The doc also removed 13 fragments of calcified cartilage (the largest ones were 1/2 and inch in diameter!). Apparently the detached and floating dmg'd cartilage would feed off the synovial fluid and essentially become asteroid looking hunks of bone. Lovely. Lol. Anyway, it's been several yrs now and I have not had a recurrent dislocation but have had intermittent pain (particularly while sleeping). Also recently it seems to feel as if it is coming out "partially". Need to get it checked again. Percocet was my best friend post surg. as with all procedures; they are only as good as the doctor who is operating. allways see a sports medicine ortho. i was lucky i had the dr. of a nfl team do my procedure and i have heard of some terrible results from this procedure.please do your homework and ask how many procedures the dr. has done prior to yours. good luck and i have seen ads for lawsuits resulting from the brand of anchors used and the procedure in general. I had my open Bankart on Aug 1st 2011 at Loma Linda, VA Hosp. Doctor is an ex Pro Basketball Ortho Surg. It's been 3.5 weeks. Feeling good, no throbbing pain just stifness. Still in sling. No P/T yet, but scheduled in the 5th week. If you can do your job in a sling (like me)I was back to work in 3 weeks. This gives you 2 weeks of major bedrest/sleep while on the pain drugs. After 2 weeks I was able to handle the moderate pain without drugs. And it took the 3rd week to kinda detox from the vicodin (sleep it off). Then went back to work. Good Luck! There are a wide variety and many severity levels of shoulder injuries out there. A lot of bankart patients can eventually resume doing full workouts, such as full bench pressing, etc. The important thing is that you take it very slowly and be very gentle with your shoulder in the first months after surgery and do just what the doctor and PT advise. procedure performed 4/4/12 left shoulder open greater tuberosity open reduction and internal fixation,open bony bankart repair.It is now 8/9/12 and not having much luck getting range of motion back.No strength either. I had Bankart done in 2002.It was the best thing (I think) I have ever done. My arm was so loose that it was popping out in my sleep. I had very limited activities that I could do with out having to reset my arm or going to the hospital if I couldn't reset it. Now After the bankart I am back to normal activates ( sleigh riding, manual labor, riding motorcycles, playing with the kids) with no limits. It has been 12 years with no problems. I just want to wish fast recovery for everyone suffering from the post bankart surgery pain. Anyway in12/6/2014 i did the open bankart repair and just want to ask if i will be able to resume my daily life operations two months after? Will i be able to swim after exactly 2 months? I am having a very hard time in sleeping on my back is it that bad to sleep on my operated hand? Just had surgery: rotator cuff repair/biceps tenodesis/capsular shift repair/bankhart repair/labral repair.Former pro football athlete which means years of weight lifting (300 lbs + bench), just a cyclist now (2000-3200 miles Apr.- Oct.). October - march teach spinning some weights nothing like before. Had top notch ortho sports Dr. Hope his skills are the best my shoulder will ever need. After reading several threads on these surgeries, think its wise to send my sports machoism on a long vacation & follow Dr.'s orders. I thank all for input on this topic. Know sore & limited for awhile best to take it slow best results.